Yinka is an Army veteran who became a lawyer and is now serving as Senior Vice President, Philanthropic, Donor and Community Services at United Way of Greater St. Louis. Try the case is in front of you. Listen to the evidence of a situation as it comes. Take the hard jobs. It will make you learn more. Yinka Faleti emigrated to the United States from Nigeria at 7 years old. It was then that he met his father and two of his sisters who were born in the US since his mom and dad came before him. His father moved to make a better life and kept pushing Yinka to make the most of the American Dream. Yinka followed that path to the US Military Academy at West Point and became an Army Officer. 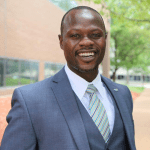 After serving with two tours overseas, Yinka left the military and pursued a law degree in St. Louis. He entered private practice for a few years before becoming a prosecutor. Then he saw the same young Black man at the defense table and for the second time, his job was to put him in jail. For too long he’d been catching mostly young, mostly Black, mostly men on the back end of a resource-depleted tough life. With limited options, these folks made some bad choices and Yinka was looking for a way to help them make better ones. He took an opportunity to work with the United Way and has been there since. Now he helps raise money for the organization in order to make a difference for young people of color through organizations like Boys and Girls Club, shelters and more. Listen as you learn how he traveled his path and grew to a place of having an impact on a city of over 3 million people.